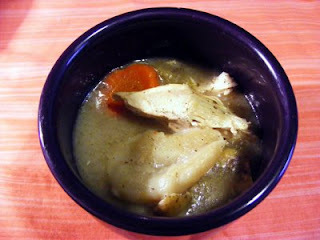 Boil in a large soup pot, chicken, water to cover chicken, carrots, celery, sage, salt, and pepper. When chicken is done and falling off the bone, remove from pot and let cook completely. Once cool remove all meat, Raven likes the skin in the dumplings so I add it back but you don't have to. Now is the time to make your dumplings. Sift 6 cups of flour with 1 t baking soda, make a bowl in the middle of flour, this is where you will add your water. I start with 3 cups of warm water. You may need more. Mix with your hands until lit resembles a hard biscuit dough. Now roll out dough to 1/4 inch thickness and slice with a pizza cutter 2 inch squares. Bring broth to a boil and add dumplings, be sure to stir once in a while. Boil dumplings for 10-15 minutes, lower heat and add chicken back to pot and boil for 10- 15 minutes longer. I hate it when chicken gets stringy, this is the reason to add the chicken and the end of cooking. Mmmmmmm ... this reminds me of my great-granny's recipe. Amen for good southern recipes!